I attended an athletics coaching seminar in Stevenage on Saturday morning and afterwards it was straight on the train to Finsbury Park with no opportunity for lunch. 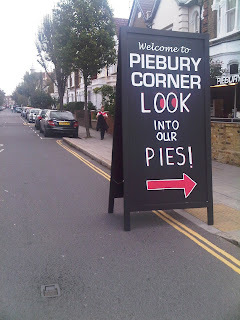 No problem, however, as it gave me another opportunity to visit Piebury Corner. I approached the counter and ordered the Tony Adams Steak ‘n’ Ale. I then noticed that my previous blog about Piebury Corner had been printed out and was attached to the front of the stall! Having revealed my identity, I got talking to the proprietor, Scotch Paul, who gave me the background to Piebury Corner and his vision of Piebury Corners at every football ground in the world (well, the Premiership, at least). He also tipped me the wink about a high-class burger joint near Drayton Park close to the school with the lifeboat in the playground. So shouldn’t be too hard to find and is on the list for a visit once I’ve gone through the menu at Piebury Corner. 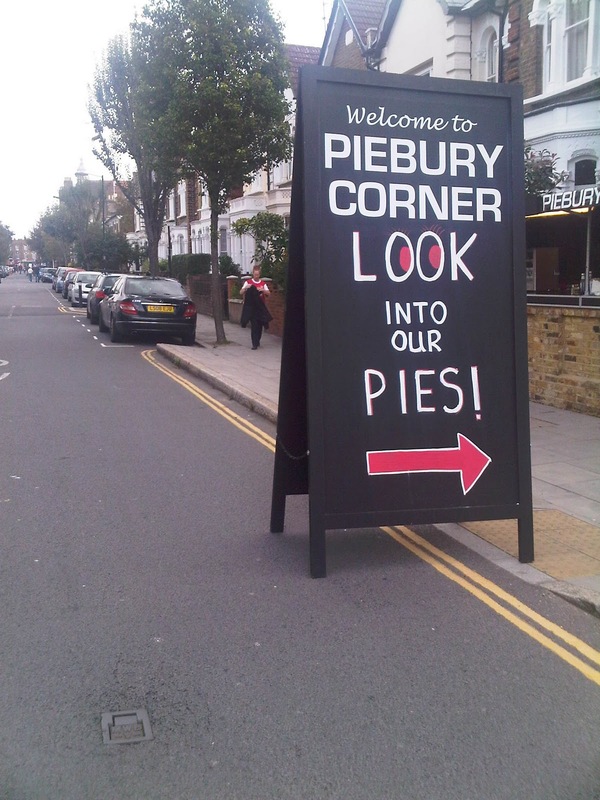 With a home Champions League fixture on Wednesday night, it’ll be once again down to Piebury Corner for pre-match sustenance. At the moment, I’m tempted to go for the Reg Lewis which is the veggie option. The Tony Adams was excellent but, on balance, I have a slight preference for the Dennis – see League table below. Incidentally, there is now a new sign outside the stall which is about 12 feet tall. So keep your eyes open so you don’t walk into it and take the opportunity to have some really tasty pre-match food.